Sandvik Coromant has announced a new range of CoroMill Plura small ball nose end mills, which are suitable for profiling applications in medium hard to hard steels, ranging from 35 to 72 HRC. 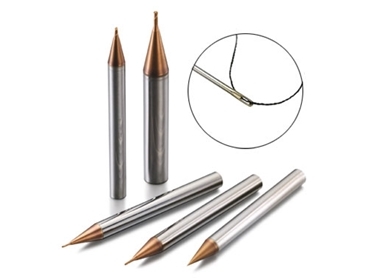 Featuring small diameters down to 0.1mm, these end mills are well suited for use in applications where a high degree of precision is required, such as small die and mould manufacturing. They exhibit high hardness and high wear resistance, with an accuracy of +0.003 / -0.007 mm. The geometry design of CoroMill Plura ball nose end mills prevents their radius from deteriorating due to uneven wear, with edge preparation also provided for improved wear behaviour.